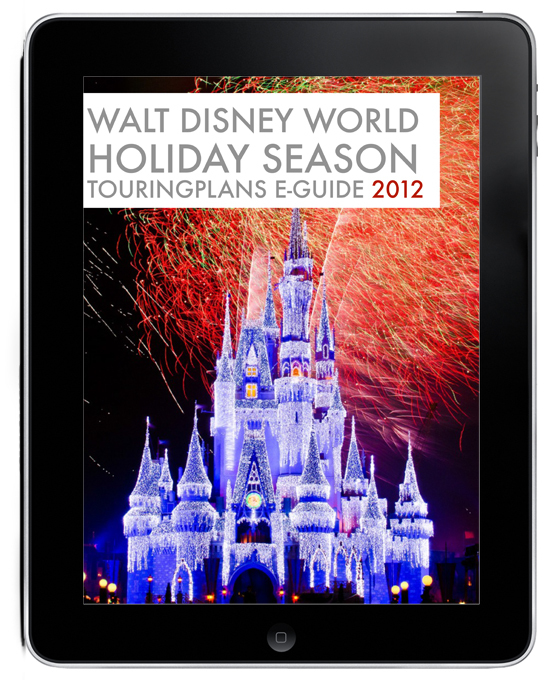 Thanks to everyone who has purchased our new TouringPlans.com eBooks: Disneyland: Holiday TouringPlans eGuide 2012 and Walt Disney World: Holiday Season TouringPlans eGuide 2012, and double-thanks to those who have sent kind notes complimenting us on the eBooks. We poured a lot of time and energy into these eBooks, so it’s great to hear that readers are enjoying them! For those of you still on the fence, we thought we’d share a little more of the Walt Disney World Holiday eBook! By clicking here you can access a PDF containing two sample sections from the eBook! (Note: due to file size limitations, this sample section has been compressed and its image quality is lower than the quality of the full eBook.) These are just a few of the pages and photos contained in the full 111-page eBook, which features over 150 high quality photos of Walt Disney World at Christmas! Walt Disney World Holiday eGuide 2012: Click “Add to Cart” to purchase Walt Disney World: Holiday Season TouringPlans eGuide 2012. Disneyland Holiday eGuide 2012: Click “Add to Cart” to purchase Disneyland: Holiday TouringPlans eGuide 2012. For more information on these Holiday eBooks, including additional screenshots, please click here. So far, only got to Page 2, but has this got the Touring Plans humor? “Designed and produced in the United States of America.